Security Cages. LockersUSA delivers and installs daily in New York City, Brooklyn, Queens and the Bronx. P(917) 701-5795. Open 7 days. Machine Guarding Cages. Modular design allows us to create any layout needed cost effectively. Nationwide deliveries. 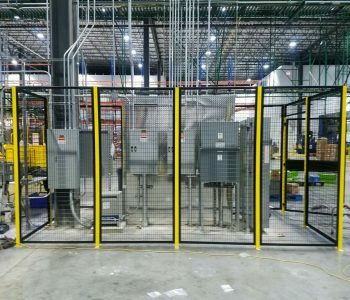 Machine Guarding - Perimeter Security Caging stocked in NJ. Free code compliant layouts, Quick Delivery. Machine Guarding Cages stocked in 3 standard heights. 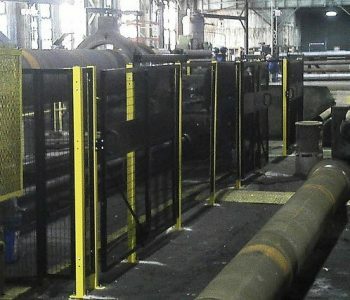 Machine Guards - Safety Fence. Daily deliveries nationwide. 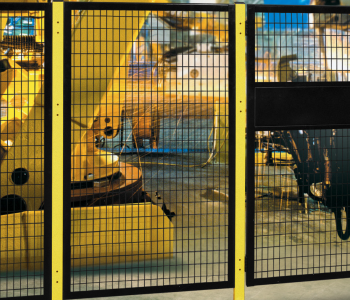 Machine Guarding Safety Fence for Lathes and other Machine Shop machinery or Automated equipment. Free code compliant layouts and quotes. 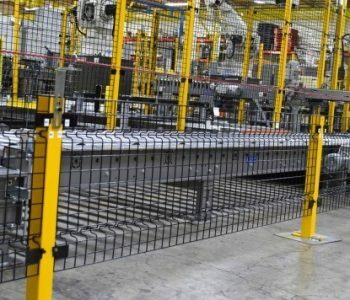 Framed Welded Wire Cages are made with 8-gauge welded wire, galvanized or powder coated finish in six standard colors. These welded wire that comes in 1” x 1” or 1-1/2” x 3” square grid patterns are available in a variety of widths and heights. You have a choice of either hinged or sliding doors. Plus, you can select from multiple lock options including steel encased cylinders, push buttons, card swipe, and biometric locks. 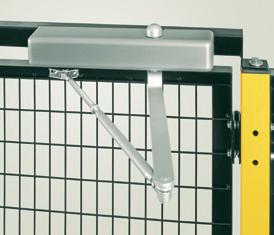 Our cages come with 2″ x 2″ x 1/4″ thick posts to the height needed with 2′ x 6 welded foot plates. You can save money by using your existing walls as a barrier. If you need a 4 sided enclosure, But your putting the cage up against a back wall and side wall, You may only need a 2 sided cage. Ceilings are available in the same 8ga galvanized steel material with all welded grid openings. Or we can build the cage to your existing ceiling. LockersUSA’s experienced technicians provides free layouts. Let us assist you in preventing theft and accidents with our code compliant complimentary layouts. Security cages are stocked in New York City, We also serve daily Brooklyn, Queens, Bronx, Staten Island and New Jersey. 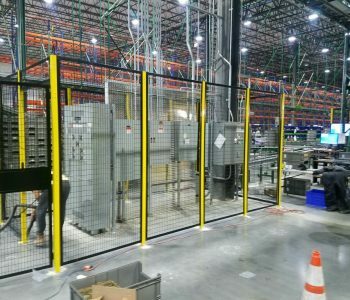 Security Cages, Security cages NYC, Security Cages NJ, security cages Brooklyn, Security Cages Queens NY, security Cages Bronx, Security Cages Staten Island. Wire Partitions Cages NYC. Tenant Storage Cages NYC, Server Cages NYC, Robotic Cages New York City.